The weather is certainly wacky this year around these parts. It is close to 70 degrees one day and then after an evening of wind advisories a cold-front comes in and whips us back into winter shape with 40 degree temperatures. I was at my son's Montessori school the other day and the bulbs outside were stretching their green shoots up out of the soggy earth, reaching for that warm sun. I think they are confused. We still have three long weeks until that day marked spring on the calendar. We haven't come in like a lion or gone out like a lamb. And Punxsutawney Phil even predicted more winter weeks. I'd better watch what I say though. At the rate we are going we are sure to have a late March snowstorm when we expect it least. Nevertheless, my body is yearning for spring time already. Perhaps without real snow, ice, and cold jacket weather, my toes might actually be thinking it might be flip flop time soon. And so, when I think spring, I think flowers. Daffodils and cherry blossoms to be exact. When I first moved to Washington DC, that spring it started snowing. I remember looking out of my office window and seeing white flakes floating in the air. They were gliding this way and that, where ever the breeze would take them. These white flakes turned out to be cherry blossom pollen. And I turned out to be allergic. But to me those white puffs blowing in the breeze still signal to me that spring has sprung. Spring also makes me think of color. Brilliant violet crocuses with vibrant orange centers adorn my neighbor's lawn. Fresh dewy green buds that pop out from every branch. And of course pretty Easter pastels come to mind. 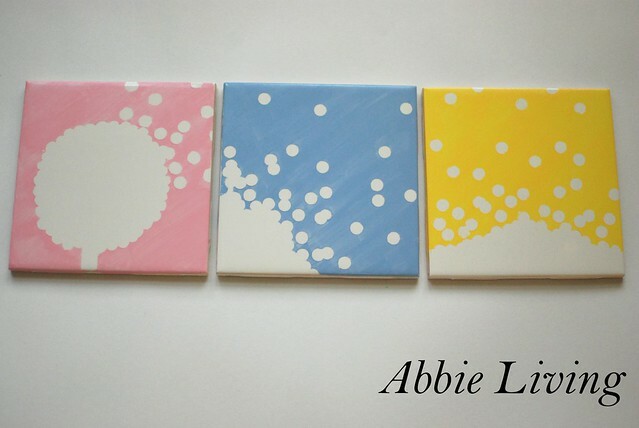 These painted tiles are inspired by the spring flower puff that takes off and alights on the gentle breezes of spring time. With a modern twist, this pretty design is easy to make and elegant to display. Time: about 1 hour to create one tile; 1 hour 15 minutes to bake the tiles; and then I didn't keep track of the time it took to cool. I just left if there and picked them out of the oven some 6 hours later before baking a chicken for dinner. 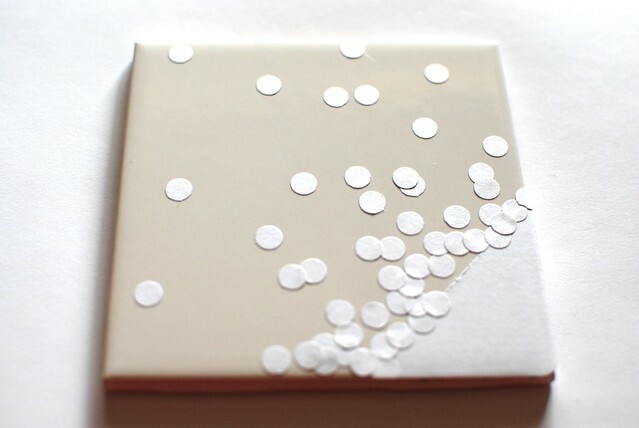 How to Use: gift these as a set of coasters for a birthday, a hostess gift, or house-warming present. Attach a ribbon to the back of each one and hang these in a group. 1. Clean the tiles with warm soapy water, rinse, and dry well. 2. 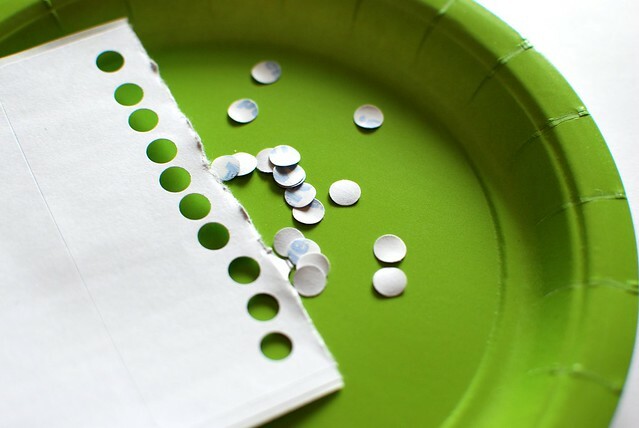 Use the hole punch to punch out a million dots from the sheet of adhesive labels. Okay, not a million, but you can see I used a lot. Make your own design and use your own judgement on the number you use. I just stopped when I got tired of sticking dots. 3. 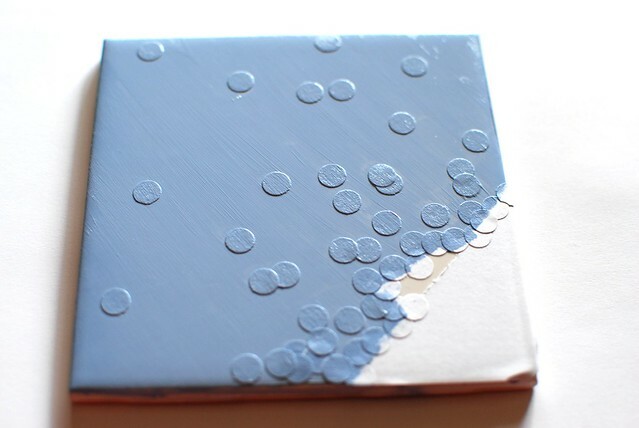 Peel off the label backing and stick the dots onto the face of the tile in your design. 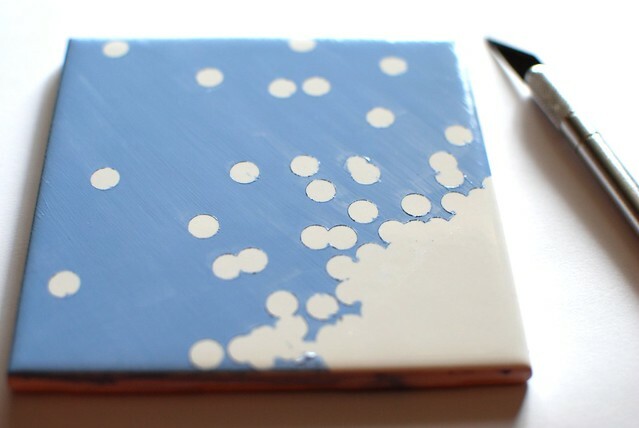 Use the back of the X-acto knife to smooth the dots onto the tile. 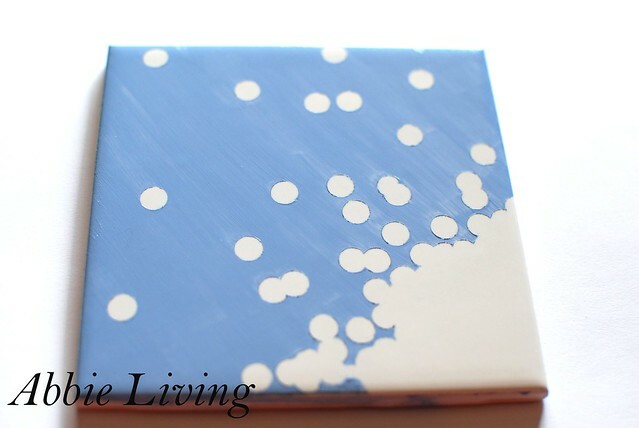 Don't use your fingers, or you risk getting oils onto the tile which makes the paint streak. 4. Paint over the entire tile surface, stickers and all. If you need to, do two coats. Let air dry for about 30 seconds, or until tacky. Mind your brush strokes. Make them light and even and make them all go in one direction. I actually made my first coat go in one direction and then turned the tile 90 degrees and did the second coat. Use as little paint as you can to get good coverage. 5. Use the point of your X-acto knife to remove the stickers before the paint completely dries. Then use the tip of the X-acto knife to clean up any smears or smudges. 6. Follow the drying directions on the paint bottle. Mine said to stick the tiles in a cold oven, set the pre-heat temp to 350 degrees F and then bake for 1 hour. Turn off the heat, and let the tile cool inside the oven. When completely cool, remove the tiles and they are now hand-washable and top-rack-dishwasher safe. I did this while watching TV while Pie Pie was sleeping upstairs. This craft project is that easy. 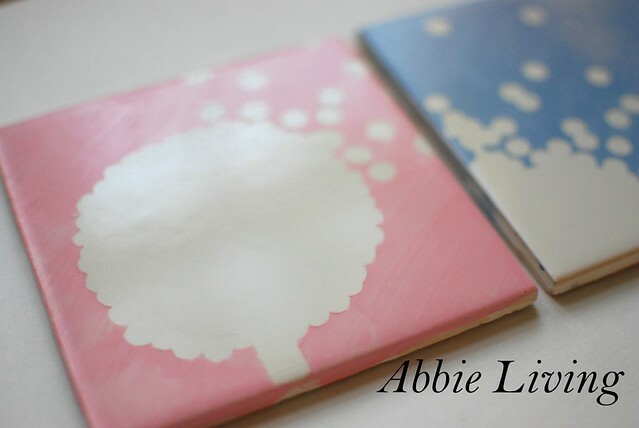 Here is a couple of the pieces that inspired me to create this craft project. Thanks to all the artist out there who inspire my crafting work every day. That is and awesome idea! Just like finding gold in a desert. I will try this one soon when I get back home. Please do more projects like this.